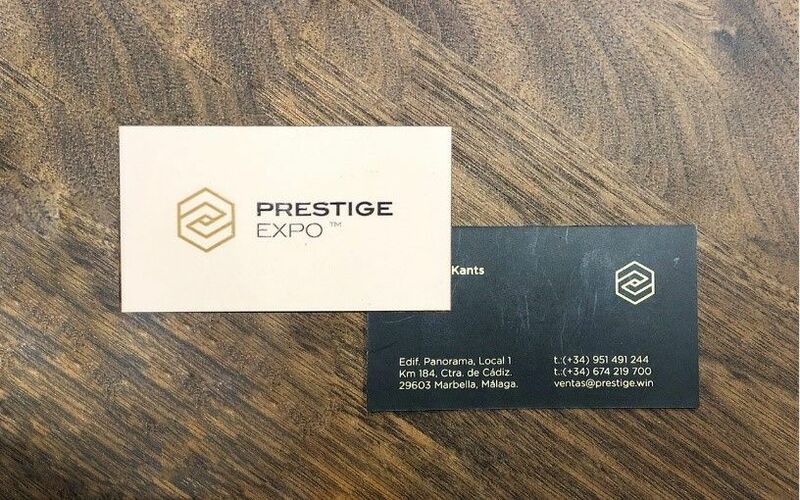 At the beginning of the year, we acquired a new client, Prestige Expo, a successful luxury real estate company based in Marbella on the Costa del Sol. They contacted us to help them with the development of an exciting new project of three exclusive villa developments and also to help improve their existing brand image and give it a little ‘upgrade’. 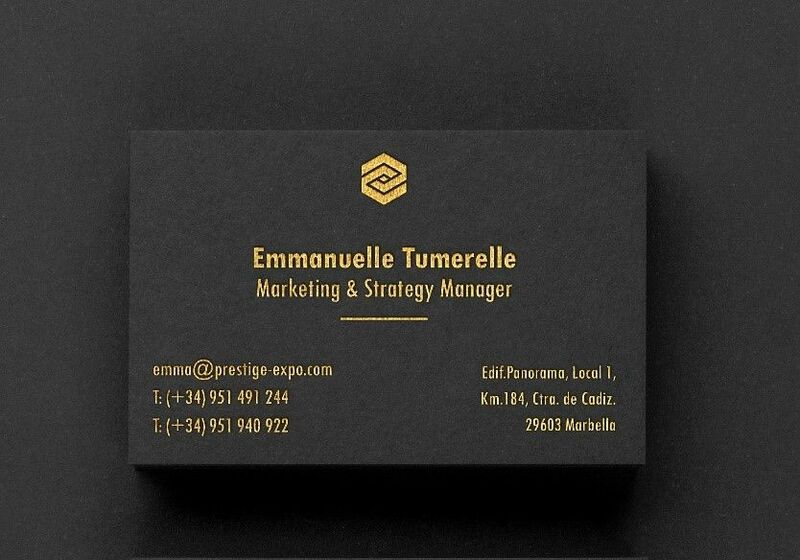 We started by studying their logo and existing stationery. As we didn’t want to make any changes to the logo as it is well-established and recognisable for clients, we suggested that the business cards should be updated, as it is always a good idea for companies to periodically give their image a little ‘upgrade’ when it comes to branded materials. 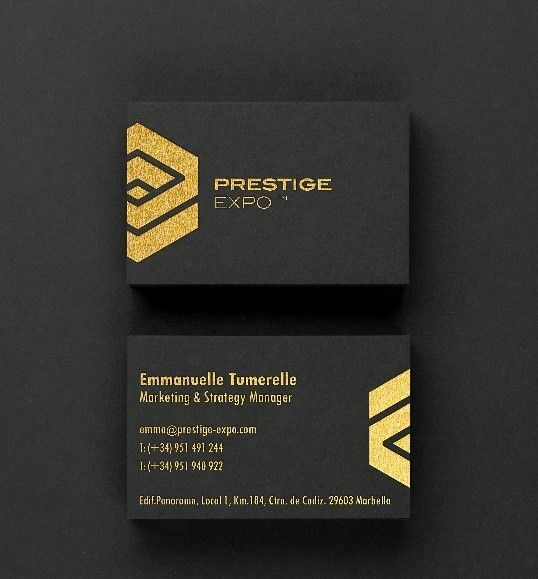 We started to work on some ideas for the business cards taking into consideration the fact that this specific real estate agency work with the most exclusive and luxurious developments on the coast, so it was established that the new business cards should transmit elegance and affluence. This led us to the choice of colour palette; yellow and black are the main colours of the website so we decided not to go too far away from the established brand colours but opted to replace the yellow with gold. In terms of the process we wanted to give our client several design ideas for the new business cards, so we worked on two versions: one single-sided and the other double-sided. We like to offer our clients at least two varieties of design, so they don’t feel pressured or limited. As you can see from the images above we opted for a simple, clean and modern style with a clear font for the text. The important thing to remember when you work with bold colours such a gold, is not to overdo it. Simply by adding such a strong colour reference your product automatically makes a statement, so it’s very important to find the right balance, which we feel we successfully managed to do in both cases. Another crucial factor in successful branding is what type of paper and printing materials you use. Having an amazing design sometimes is not enough when printed on low-quality paper. So we chose a recycled, textured matt black paper with a golden varnish finish for the text. By going for recycled paper, we show that the company cares about the environment, chooses to use eco-friendly materials and it also gives a nice natural finish. The business cards that were presented to the client had very positive feedback and they were pleased with the final result. If you noticed we mentioned at the start of this case study that we were contacted by Prestige Expo to help them develop a project for three luxury developments on the Costa del Sol. This is still an on-going project and we are very excited to be involved in it. So make sure to stay with us, as we will soon be revealing more about these prestigious developments. Meanwhile, if you have any questions about your corporate brand or would like us to help you with the creation of a new brand, contact us today, as our team will be happy to give you guidance and help you in this mission. Engage Manifesto.